To mark Book Week Scotland 2018 and the 550th anniversary of the death of Johannes Gutenberg, the National Library’s copy of the Gutenberg Bible was on show publicly yesterday for 8 hours. Ours is the only copy in public ownership in Scotland, and this was the first time we put both volumes on display together. People queued for up to an hour to see “the Gutenbergs”, and 1,017 people came through the door to view it! The Gutenberg Bible, also known as the 42-line Bible because each page has two columns of 42 lines, was printed in 180 copies. It took about three years to print, and in 1455 copies went on sale at the Frankfurt Book Fair. The printer of the first book printed in Europe with moveable type was Johannes Gensfleisch, also called Gutenberg after the place in the German city of Mainz where he lived and where his printing workshop probably stood. 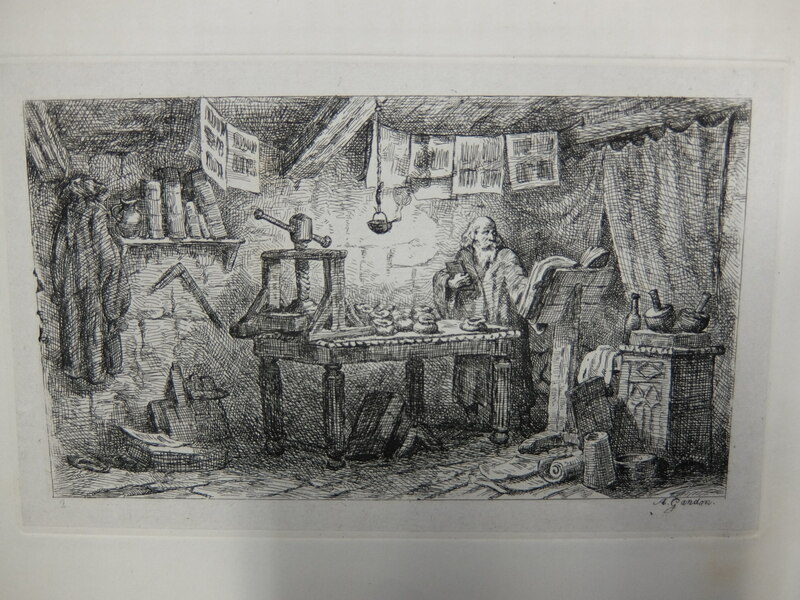 The project was mostly financed by the businessman Johannes Fust, and it is mainly due to a documented quarrel between Gutenberg and Fust about money that we can piece together the story of how printing was developed and how the Gutenberg Bible came about. 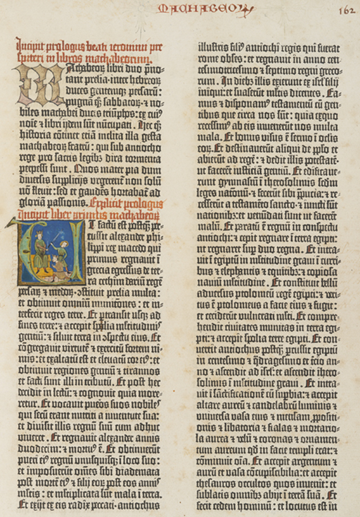 Before and alongside the production of the Bible, Gutenberg experimented with different single-sheet texts such as indulgences and calendars to find the best metal alloy for the type, the best ingredients for the ink, and the best way to print the sheets. 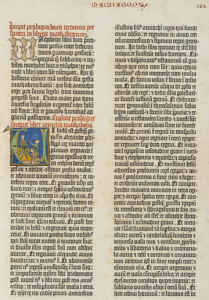 The text of the Gutenberg Bible is that of the Vulgate: the translation of the Old and New Testaments from Hebrew and Greek into Latin done by the 4th century theologian St Jerome. Thanks to Gutenberg’s invention, multiple identical copies of the same text became available to the European public for the first time. There are some caveats to this bold statement: as the digitisation of different surviving copies has brought to light, not all copies are in fact identical – there are a few differences in spelling between some copies for instance; and of the 180 copies printed, more than 150 had already been sold by subscription before they even came on the market, which basically consisted of monastic houses, so it was not exactly widely available to the literate public. 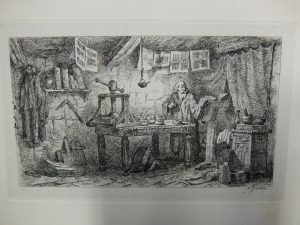 But printing, or “the art of multiplying books” as it was called then, revolutionised the production and consumption of texts, and led directly to the rise of literacy across Europe. Historical events like the Lutheran Reformation and movements such as Renaissance Humanism would have been unthinkable without the invention of the printing press. The Gutenberg Bible is one of the world’s most famous books. Of the 180 copies originally printed, only around 20 complete copies containing all printed pages survive today. Most of them are printed on paper and come in two volumes; some were printed on vellum or parchment and take up three or four volumes. The two-volume copy going on display was sold to the Advocates Library in 1805 or 1806 by David Steuart (1747-1824), Lord Provost of Edinburgh, who was also a book collector. At the establishment of the National Library in 1925, it was given over to the nation. As the custodians of this treasure, and indeed many more, including the first books printed in Scotland in 1508, we ensure that our collections are kept in safe and environmentally appropriate conditions and will be available for generations to come.